This Nielsen symphony coupling, the first release in a projected cycle, promises much. Everybody involved, Oramo himself, the Royal Stockholm Philharmonic, and even the record label BIS, have impressive track records in this repertoire. Nielsen’s symphonies have become well-represented on disc in recent decades. From one perspective, that increases the competition, especially given the quality of some of the cycles out there, but from another, it demonstrates the subjectivity of interpretation and the level of interpretive input required. Nielsen’s symphonies rely on a certain shock value, their radical structuring and unusual orchestration are central to their appeal. Familiarity blunts their edge, so any conductor coming to them today has to find a way to make the music sound fresh and new, but not to the point of wilful idiosyncrasy. Oramo’s readings are energetic and dynamic. They are also intelligently structured. The only problem is that they are a bit safe, and never go to extremes of dynamic and expression. Oramo drives the music, pushing through every phrase. But he also prioritises clarity and focus of tone. There are rarely any extreme outbursts, of the kind the punctuate Bernstein’s Nielsen, and instead the climaxes and complex tutti passages fit seamlessly into the simpler surrounding textures. 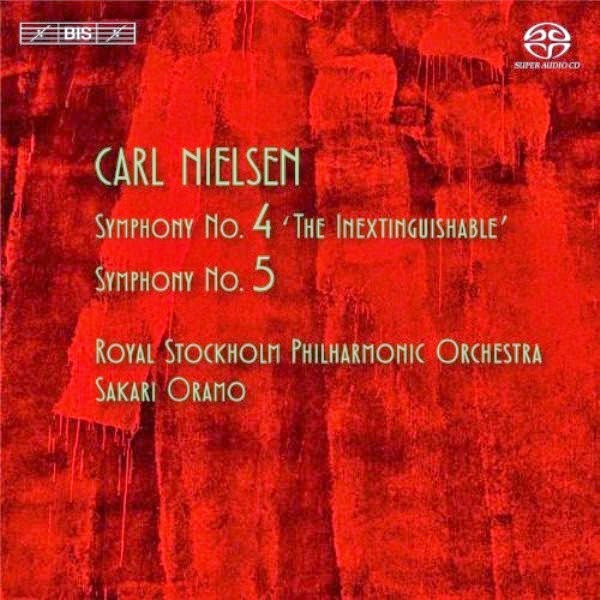 The control and intelligence of Oramo’s interpretation has clear benefits: he always ensures that the important lines come through, even when they are in the middle of the textures (the prominent viola lines in the Fourth Symphony are particularly clear and resonant) and the sense of direction he gives the music ensures that there is always a feeling of underlying logic, however esoteric Nielsen’s structures become. All of this comes at a cost to the spontaneity and dramatic effect of the music. Tension, while often present, always feels controlled. The conflict between the snare drum and the orchestra in the Fifth Symphony, of example, has little sense of anger, let alone danger. The (unnamed) drummer himself is suitably disruptive, but the response from the rest of the ensemble is too accommodating, too genteel. All of which is a shame, because in all other respects this is an excellent recording. The orchestra clearly has this music in their blood, and the fine balance in the textures should probably be attributed in equal measure to the players’ sensitivity to the work, to Oramo’s attention to detail and to the sound recording. Given BIS’s phenomenal reputation for sound engineering, the sonics here may disspoint some. The orchestra sounds distant and the recording slightly uninvolved, although the extreme channel separation on the SACD stereo mix compensates somewhat. The clarity of sound, though, is never in question, and the recording does full justice to Nielsen’s groundbreaking orchestration in every respect. Among recent recordings of Nielsen’s symphonies, this projected cycle seems most similar to that currently underway with Alan Gilbert and the New York Philharmonic on Da Capo. In both cases, a world-class orchestra demonstrates their superior technical proficiency working with a conductor whose main piorities are pacing and structure and who are prepared to sacrifice some drama to these aims. If anything, Oramo has the edge over Gilbert for the idiomatic playing of his orchestra (which, ironically, used by Gilbert’s orchestra). The big, glossy, American sound of the NYPO sits uneasily with Nielsen’s often astringent textures, and that is as much a problem for Bernstein’s cycle as it is for Gilbert’s. Oramo, like Gilbert, seems to be imposing some very modern anti-Romantic ideas about the way this music should be performed. Nielsen’s own anti-Romantic disposition suggests there is some validity to this approach, but it remains a minority position. Even so, both Oramo and Gilbert seem intent on dominating that niche, and if their respective first volumes are anything to go by, it is Oramo who is going to come out on top.